In a large non-stick skillet over medium heat (by slightly closing the SuperSaver air regulator), cook bacon until crispy. Drain bacon, and leave 2 tablespoons of the bacon fat in the pan. Add rice to pan and toast, stirring often to evenly coat the grains in the bacon fat. When the rice begins to crisp, push the rice to one side of the pan, then add the eggs. Scramble the eggs on the other side of the pan, stirring with a wooden spatula (mwiko). 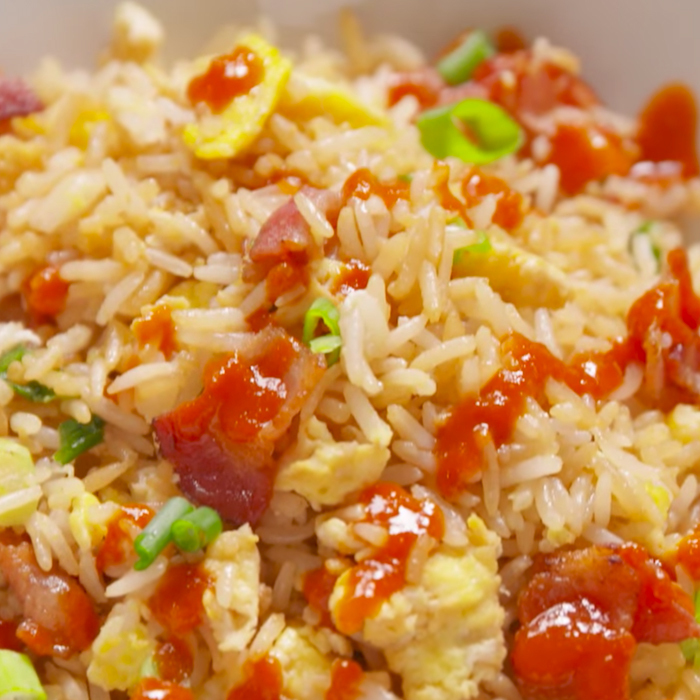 Combine rice and eggs together once the eggs are almost cooked to your desired doneness. Add onions, soy sauce, sesame oil and drained bacon bits to the rice. Mix well, then turn off heat and adjust seasoning, if necessary. Serve with a generous drizzle of hot chilli sauce to your family and see them enjoy and want more!